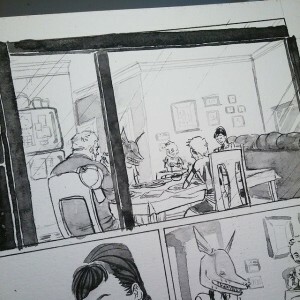 Here’s a glimpse at Wolfgirl, the new comic that Morgan Lee and I will be pitching soon-ish. Writing this story damn near broke my heart because I torment these likable characters so much, and Morgan’s art is the perfect fit to rock the emotions in these scenes. I’m finishing up the letters tonight and will have preview pages at Baltimore Comic-Con. Wish us luck!